A WhatsApp message, announcing the dates for the 2019 general elections in India, is actually a hoax. A WhatsApp message, claiming to announce the dates for the 2019 general elections, is making the rounds of the popular messaging app in India. The message starts with the phrase, ‘Election 2019 For All India’, and lists out Indian states and union territories along with dates next to it. 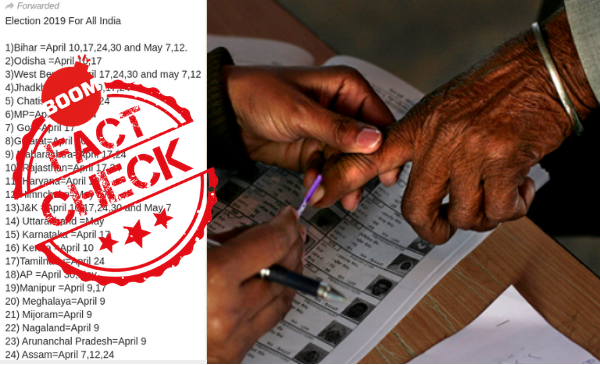 Avinash Sanas, the Deputy Commissioner of the Maharashtra State Election Commission, rubbished the claim saying, “the dates have not even been confirmed yet”. BOOM, through its helpline, has received a flurry of such messages from people, leading us to believe that it has gone viral on WhatsApp. We also found several users sharing the message on Facebook and Twitter. Besides the fact that the official dates have not yet been announced by the Election Commission, we found several issues with content of the message itself. Firstly, it lists 25 states and 5 union territories, while India has 29 states and 7 union territories. Missing in the list are Uttar Pradesh, Telangana, Puducherry, Daman & Diu and Punjab. Second, would be the two odd entries in the list – namely ‘Badranagar Habeli’ and ‘Simon’. Given that no such state or union territory exist in India, we took our best guess as to what they mean and came up with Dadra & Nagar Haveli and Sikkim, respectively, given that these two states were also missing in the list. 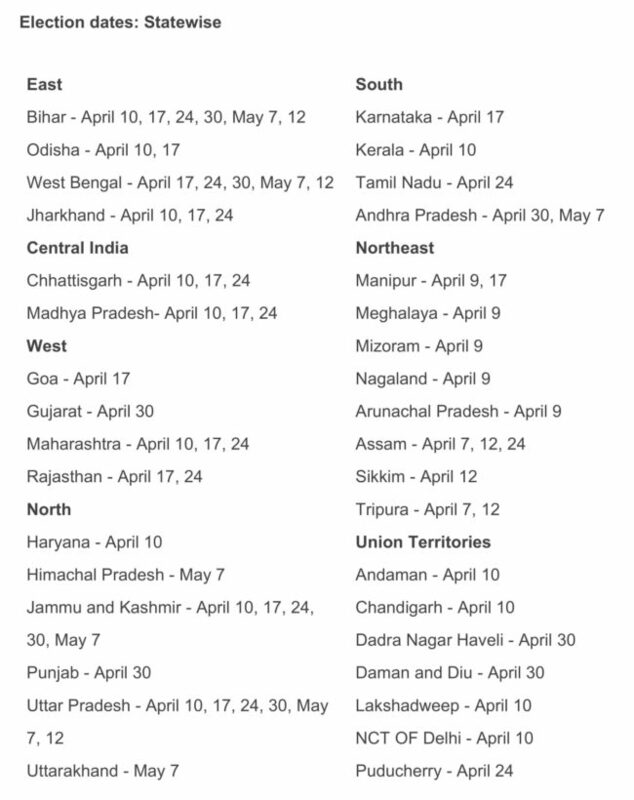 Third, would be the fact that these dates seem to match the dates for 2014 General Elections in India almost exactly. 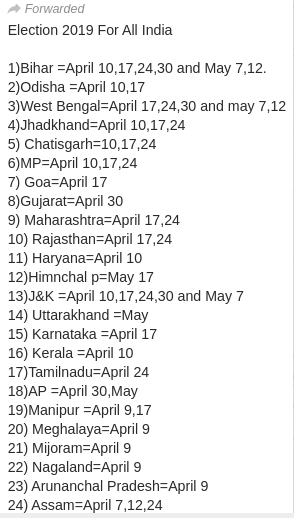 You can find the dates, as reported by News18 here. It seems the fake news factory has complacently tried to pass off 2014 Lok Sabha elections’ dates as the dates for the upcoming elections. India, known as the world’s largest democracy, is credited to hosting the world’s largest elections. During the 2014 general elections, around 814 million voters were registered to vote as reported by The Economist.